What: "It uses its instructions, the gene, to produce a sports car or a tractor. The product of the ribosome however is a protein. Now each of the proteins is a long chain made up of 20 types of building blocks. The sequence of the building blocks dictates how the product will look." What: "In my opinion I believe that attached ribosomes are like students in a class room , and free ribosomes are like students in the hallways." What: Trains, freight and passenger, are made up of individual cars linked together to form a unified whole which transports goods and people. Polymers, in this case, bio-polymers, such as mRNA and protein, are molecules made of smaller monomer units. In the case of proteins, the monomer units are amino acids. In the case of mRNA the monomer units are ribonucleic acids. The monomers units are like individual trains cars that can be linked up to form a working whole. A rail switching yard is a place where many tracks and trains can come together in an ordered way so that they can be hooked together as a functioning trains. A ribosome is a location in a cell where individual elements come together to a make a functioning whole. So when thinking of a ribosome, try to visualize a rail yard which many individual cars coming together in an ordered way to create a train. "Anyway, you can think of the ribosome as sort of the 'skillet' of translation; it's the place where all the action happens. The ribosome serves as a central hub where all of the ingredients are combined by the cell's machinery. So if the ribosome is the skillet, and mRNA is the recipe, then what exactly are the ingredients?" A ribosome is like a lunch lady because she makes protein for the kids to eat. "a machine that does jigsaw puzzles, placing pieces where they fit to build a larger unit." What: A ribosome provides a location within a cell with the spacial orientation to facilitate the conversion of individual amino acids into peptides. The correct peptide sequence is derived from mRNA. The energy for the addition of each amino acid is contained in an activated peptide attached to a tRNA molecule. The large scale mechanical analogy of this would be a vice holding pieces of pipe together so that they can be fused together with a welding torch. What: "I usually compare protein biosynthesis to the construction of a building. 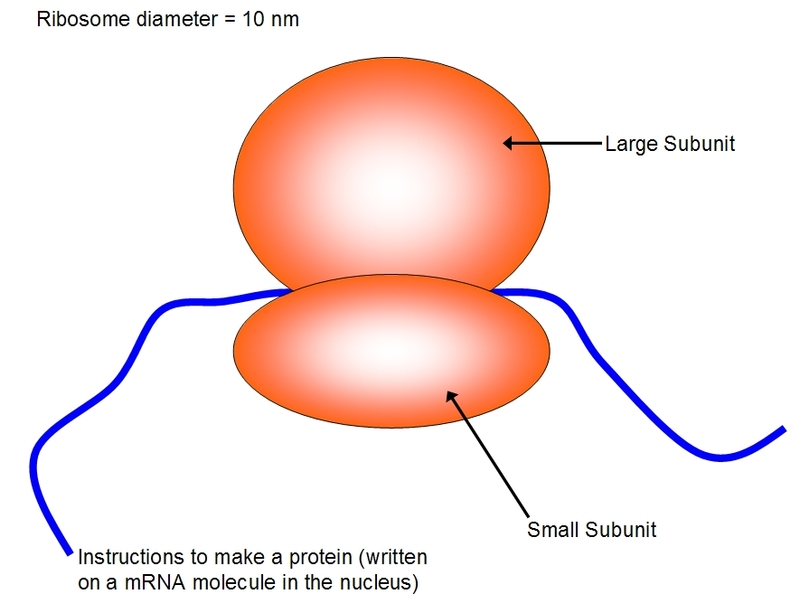 The mRNA contains information comparable to the plan of a building while the ribosome is like the construction site. The amino acids are the equivalents of blocks used for the building while the tRNAs are like the workmen bringing up these amino acids for the construction"